We, the development team of Elite: Special Forces, are doing our best to make Elite: Special Forces a groundbreaking tactical shooter on the market. Aiming for next generation graphics, the quality will be in top as well. But to ensure that the quality will be more than top-top, we wan't you to post a comment, follow our Twitter and like our Facebook; we need your help! Things have turned out bad this week for E: SF. Loss of man power means that progress the upcoming weeks will be a bit of slower. We apologize heavily, but as our community is our life blood, we find the need to tell you about this. But we can still post a few screenshots! Though nothing too excited (the excited update with a lot of our work will come in the next update hopefully, but will be a bit slowed down due to this). 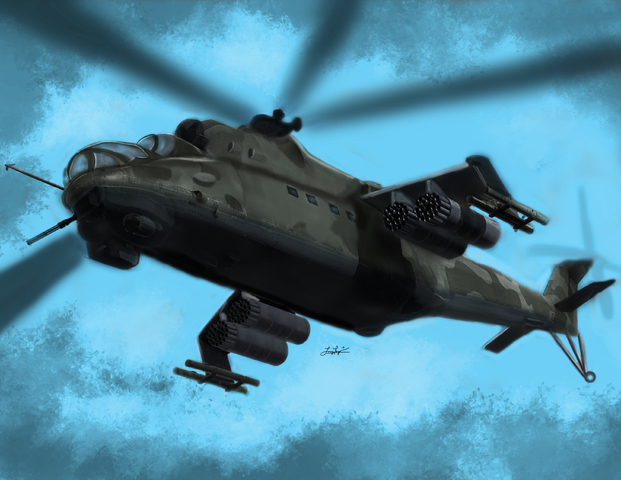 First of all, a concept of a MI-24 helicopter. This helicopter will be a Russian/Spetsnaz transport and combat helicopter. It will be able to transport 8 special Spetsnaz operators. 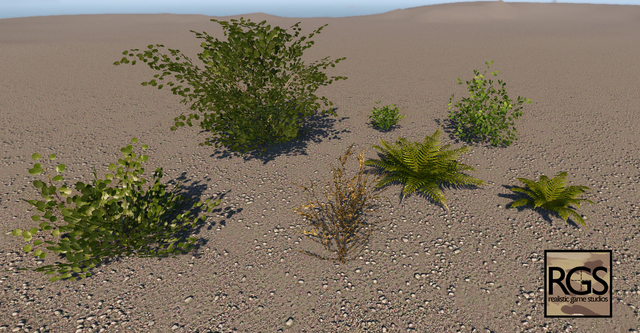 Secondly, here's a picture of some of our in-engine bushes! We have not included variations of the bushes, only the types so you can see them instead. We're still looking for following roles as well, guys! You will be responsible for the creation of high poly vehicles (mainly focusing on cars, trucks and military oriented vehicles), weapons (modern firearms or items) or environmental assets (such as tree, bushes or grass), baking them down to low-poly, optimized in-game assets, as well as being responsible for the texturing of those. As something else you will be responsible for creating mock-ups of Vehicles or Environmental Assets. Lastly you will be basing your models of some of our concept art or real life reference pictures (last said is the most used). Strong understanding of Autodesk Max or Maya. Strong understanding of Zbrush or Mudbox. Strong understand of the basic mapping process. Strong understanding of UV mapping and textures. Strong understanding of rendering (for showcasing assets). Strong understanding of Mamorset and Ddo is a big plus. Strong or basic understanding of CryEngine 3 is a big plus. You will be working in our 'Organic' team, creating different characters, based on the concept art we give you. You will be having a close communication to our Senior Hard Surface Modeler. Strong understanding of Organic Modeling. Strong understanding of the basic mapping process. Strong/Basic understanding of Ddo or Marmorset is a plus. Strong/Basic understanding of CryENGINE 3 is a plus. You will consult and advise our modelers in texturing, as well as help our junior modelers with texturing assets. You will be either UV mapping or texturing our assets. Strong understanding of Photoshop or any other texturing program. Strong understanding of UV mapping. The ability to texture assets based on either real life reference or concept art. The ability to texture assets to a very decent quality. Strong/Basic understanding of Ddo is a plus. Strong/Basic understanding of CryEngine 3 texturing is required. We decided to do a small presentation of the Modeling team and some of their work. Do you have a programmer? Since that's a pretty big thing to have if you guys want to go anywhere with this game. Programmers are a vital part of a game development team. Right now there's no need for us to have a programmer, as we have not finished too much. We're in contact with one programmer though, as we are planning to start some very basic programming soon, but not yet. We're still in a very early development phase. But I can tell you that we are planning to release some interesting stuff this or next month, so stay tuned! We need your help to get as many likes/follows as possible! We have done a team discussion about wherever we will add Italian Special Forces or not. We came to the conclusion to postpone this topic, so that we could concentrate on other things meanwhile. So we have not dropped the idea, and there's still a change we will add them in the future (before game release) or in a future DLC. Thanks! This and if we will add Italian Special Forces will be taken up at our next team meeting. Thanks! While Italy is not planned, we will do our best to add them! Thanks! Will be really nice thanks :) if u wish any information just question ;) good job! 9th Parachute Assault Regiment "Col Moschin"
Actually..the only "special forces" in italy are GOI(gruppo operativo incursori) of Comsubin (italian's marine) and 9th Col Moschin. Special Forces is a "large" name for a special trained unit. The GIS is also a "special force" in wide terms. yes i agree.. all this groups are "special units".. but if u read about italians military special forces it speaks only about Goi and Col.M.. i dunno why...GIS is not used for missions like : ok go in pakistan and kill all..probably :D ..anyway they are elites units of course ! "ok go in pakistan and kill all"
No special forces are used for that, that's what the infantry is for! Haha.